Alice in Wonderland allows players to guide, protect and aid Alice as she journeys through the world of Underland while unraveling the game's many twisted mysteries. Along the way, players call on a diverse and unique cast of characters such as the Mad Hatter and Cheshire Cat who each have unique abilities to help evade traps and solve challenging puzzles. 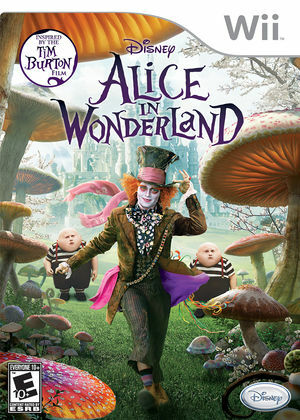 The Mad Hatter can help Alice alter her perception of Underland and take advantage of optical illusions to open up places in the world the player alone would not have noticed. Meanwhile, the Cheshire Cat can use his ability to make himself and objects appear and disappear helping Alice through this strange world. Players must choose wisely when using each of the characters' powers and combine the abilities to solve more complex puzzles. Using Internal Resolutions above 1x can cause a line of garbled pixels on the edges of the screen. This can be corrected by enabling the Vertex Rounding hack. Refer issue 10186. Fixed in 5.0-7714. The graph below charts the compatibility with Alice in Wonderland since Dolphin's 2.0 release, listing revisions only where a compatibility change occurred. This page was last edited on 10 June 2018, at 22:36.